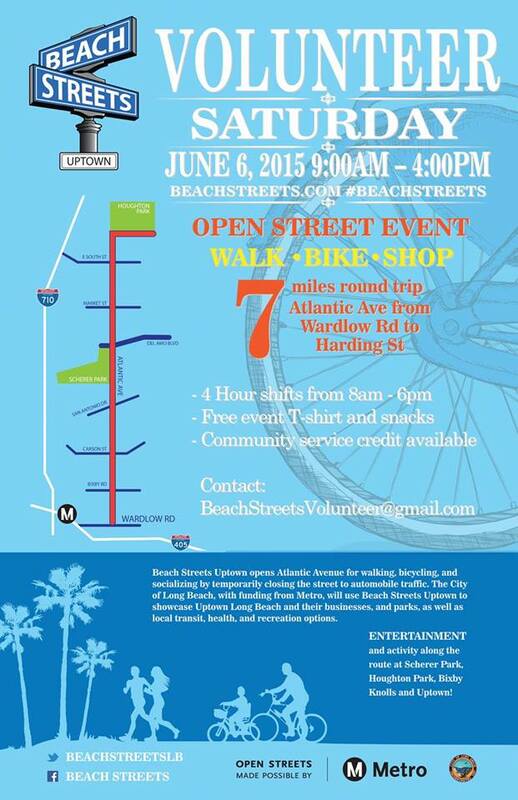 What’s the best way to be a part of the much anticipated open street event, Beach Streets Uptown? Why, to volunteer, of course! Give back to the Long Beach community by signing up for a four-hour shift that will leave plenty of time to experience the seven-mile carless course for yourself. Katie Taylor, who arrived in Long Beach “friendless” from across the country five years ago, attributes her now-strong network of friends to the city’s bicycle community. The perks of volunteering include being fed, receiving an exclusive Beach Streets T-shirt not available to the public (only 200 shirts will be made for the event) and the opportunity to be a part of Long Beach’s first large-scale open street event. Student volunteers can use their participation to rack up a few service learning hours, as well. For Taylor, signing up to volunteer for Beach Streets was a no-brainer, a way to give back to the community that has given her so much. Volunteers will work side-by-side with city enforcement to manage the flow of non-car traffic along the route, according to volunteer coordinator Hilary Kyle. Without volunteers to provide participants with information, assist with merchandise management, provide free bicycle parking at the bike valets and generally serve as the “eyes and ears of Beach Streets,” Long Beach’s own ciclovia would assuredly not be possible. An orientation meeting will be held on Saturday, May 30 of which the location is still to be decided and on June 4, two days before the event. Click here to sign up as a volunteer. For the most up-to-date information about the orientation meeting and other additional details, check out the Facebook event page here.